Mark was born and raised in Edmonton, obtaining his medical degree at the University of Alberta. He received his plastic surgery training in Edmonton with post graduate fellowships at Barnes Hospital in St. Louis and the Mayo Clinic in Rochester, Minnesota. After initially practicing in Edmonton he relocated to Calgary in 1992 becoming affiliated with the Rockyview Hospital where he is the site chief for plastic surgery. 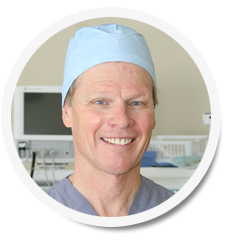 Dr. Haugrud is a member of the Royal College of Physicians and Surgeons, the Canadian Society of Plastic Surgeons, the Alberta Society of Plastic Surgeons, the Northwest Society of Plastic Surgeons and is a clinical professor for the University of Calgary. Mark is still married after 30 years to the same great woman and they have 3 wonderful, accomplished children. When not working, Mark is an avid sportsman who loves being in Calgary close to the mountains.